This week I got a chance to walk through the house while the drywall was being finished on the house. I try my best to swing in once a week. Since we are about 40 minutes each way away from the property it can be hard some weeks to get there, but with how quickly things are moving I have wanted to make sure I am able to stop in so I can ask questions while things are in progress. I have found it is great to drop off some donuts for the guys, chat with them and see how things are going. It has been awesome to get to know the crew throughout the process. As fun as it is to see it come together, I am getting a little sad to think about it finishing up. I know we have a lot more ahead of us in terms of projects, but this has been so fun and interesting to work on. Also, we have deeply enjoyed working with Shugart throughout this process as well. Rarely if ever have I had any headaches and most of the headaches had nothing to do with them and all with me making decisions. They have made this so smooth and stress-free it is shocking at times. Cannot thank Nick and his crew enough for their hard work. Okay, so that said, we are about a week and a half or so away from seeing cabinets being set in the house. Yes, you heard me right. Our cabinets are being delivered currently on the 6th in our kitchen and laundry. So, I figured it is well past time to talk about what we have been dreaming up in this space. 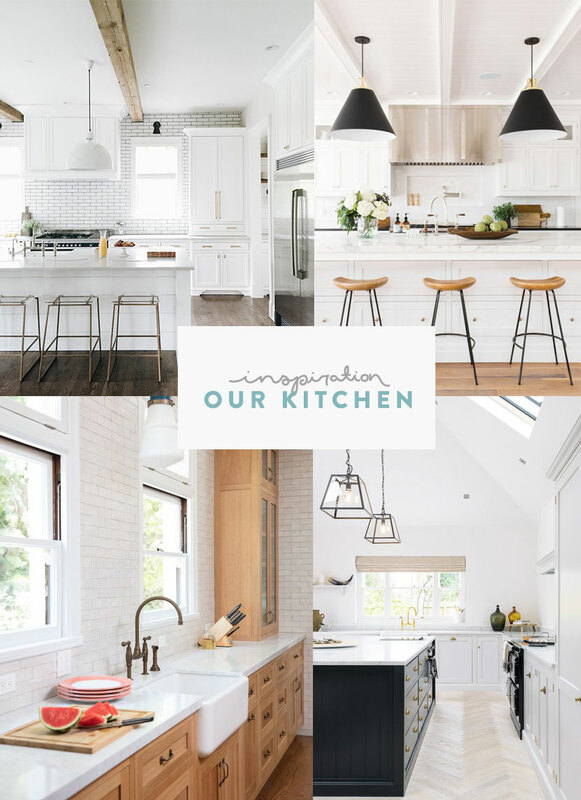 When we were designing the house I first was focused on the kitchen. I wanted a space that was minimal, family friendly, had lots of storage, and lend to entertaining as well as shooting content for the blog. Since I don’t plan to have a studio space per say, I wanted our home to be the well lit room to shoot in for food and other content for this space. So I knew exactly what I wanted aesthetically here. I didn’t want anything loud or big. I wanted it classic, modern, clean, and open. The one challenge I wanted as I have throughout the whole house is to add these elements that have touches of old farmhouse on top of Mike’s cleaner modern style. I think we achieved this best in this space. First of all, we are going with a flat front cabinet that is powder coated in a light gray tone. This color will be carried throughout the whole house on all our cabinets, closets, and vanities. Our cabinets are the standard cabinets that Hygge Supply designed for our space. Think of them similar to furniture that we build specific spaces for them to fit and they slide right in. Check them out here. In terms of the layout, we did a few things. We eliminated all upper cabinets. We personally do not like them and find them frustrating to deal with since both of us are under 5’11”. 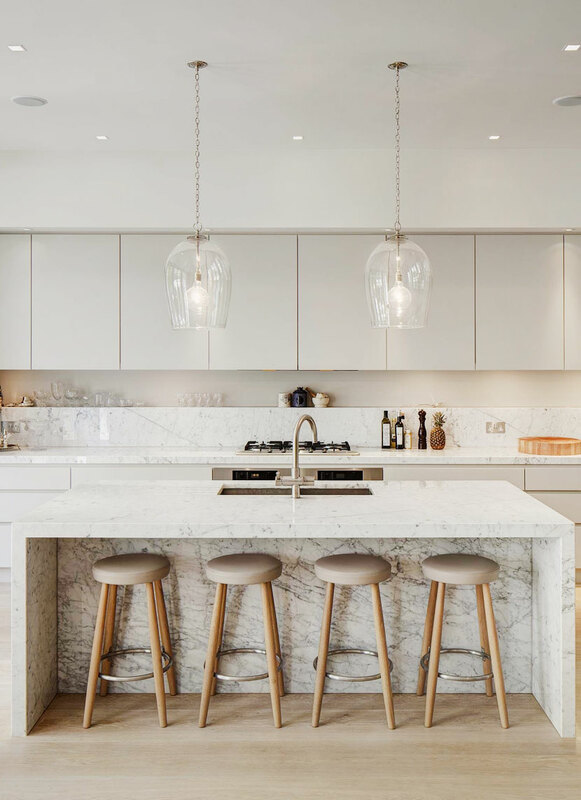 We love how a kitchen feels with it being 100% open. We didn’t design a pantry room and instead used floor to ceiling cabinets to store pantry items and things like a microwave and toaster as well. We wanted to have very little on our counters so we also have a cabinet right off of our kitchen that will be setup to be used as a coffee/smoothie station that is out the main site of the kitchen. Another awesome feature considering Mike is a huge coffee gearhead. Our hope was all of this would leave our counters as clear as possible besides a few utensils in a jar and some salt and pepper. What I wanted most in our kitchen though was a space that felt welcoming and ready to feed anyone who came in. I wanted space to do our harvesting particularly. For almost 2 years we have been living in and between places that cooking has been hard on someone who thrives on having her lauder. I wanted a space for mine so I could cook anything from our garden for anyone who showed up for dinner that night. I grew up in a family where you never know who may be at the dinner table and I love that idea, but to make it less stressful you have to have a space that allows for that. Never settling anywhere permentantly this last year and a half has made that stress hard to disappear. So this was a big deal for me. So, let me talk about how I plan to make all that happen. 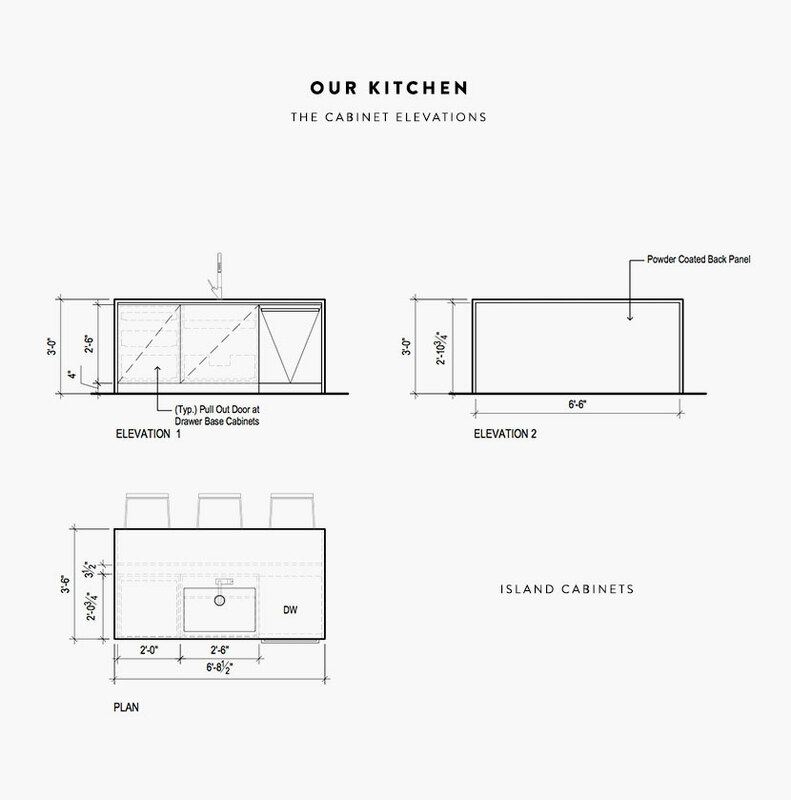 Hygge Supply did elevations of all of our cabinets and island so we could share how it will come together. Here you can see the elevation of our back wall. This will be the focal point of our kitchen more or less. On that back wall we have large casement windows that overlook a slew of Aspens. The back wall will be done in a elongated glazed brick from Fireclay tile. We will be tiling the windows and then also tiling and surrounding our hood for our range. We didn’t have to do a hood, but Mike wanted one so we wanted to find a way to hide it a little bit. The tiling will make it hidden yet beautiful. The cabinet interiors are all the same here. They will all be three differen size drawers in order to house dishes, platters, glassware, utensils, and everything we need for cooking. The big thing we did here though is pull the cabinets to be flush with the front of the 30in depth stove. Since most cabinets are 24 inches a friend’s dad who was a kitchen remodeler suggested we pull them forward and then do a 30 inch deep counter so we had a lot more space for prep while we cooked. Thankfully we had the space and took it! This elevation is of the cabinets that will hold our Fridges and pantry. We did something a little different here and we will see how it goes, but Sean, suggested doing two side by side fridges from Bosch (see the actual ones below) that will be faced with the cabinets and tucked into these cabinets. This ultimately gives us more fridge space, so I am interested to see how it goes. We also will have two pantry cabinets. In them we will also have our microwave hidden inside. This is where we will store all of our food and any other items. We have a smaller island, but we wanted to make the most out of it. One side of the sink we wanted our dishwasher which will be faced with a cabinet door and then we will have a bar on the otherside for bar seating. Currently in the house there is a wall built already that is housing the plumbing and electrical for everything. We will place a powder coated panel on the back of it to enclose the structure and hide the raw plumbing. Over the island, we will be doing a waterfall style countertop in Cambria Quartz in Swanbridge. This means the top will fall over the sides all the way to the floor on either side. I love this because I know how much traffic will be going around the sides of this island and I think this will protect the cabinets and stay clean well, which was important to me. 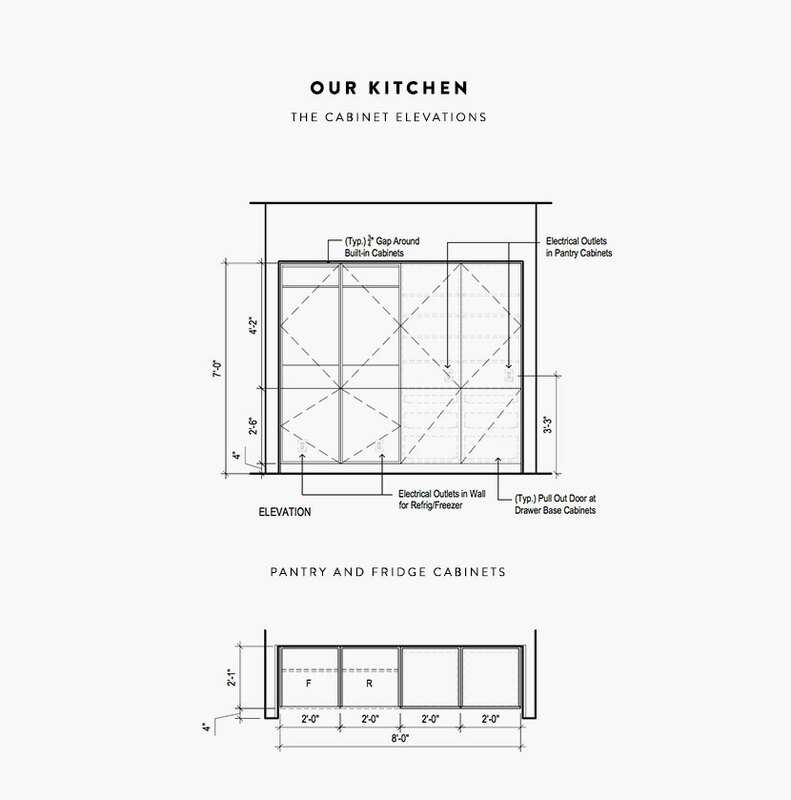 It isn’t pictured in these elevations, but we will have one more cabinet in the laundry hall that will have a counter that we will use to make coffee. Above it will be open shelving as well. It will be a great little spot to house a few extra things. So what did we choose for the space for all of our finishes and how does it look together. Here is where we landed. We feel really great about it. I am not a risky designer when it comes to my space. I like things simple with minimal color and I am a classics girl so I felt great about the simplicity of things. I figure down the road if we want to change a light at some point we can, but for now, I feel very excited about how this space is coming together. Look for more about it on Instagram in the coming weeks as cabinets and everything get placed. So tell me, what do you think of the design? What is your experience with some of these products? Are you more of a neutrals person or do you like a pop? If you did a pop where would you have done it? 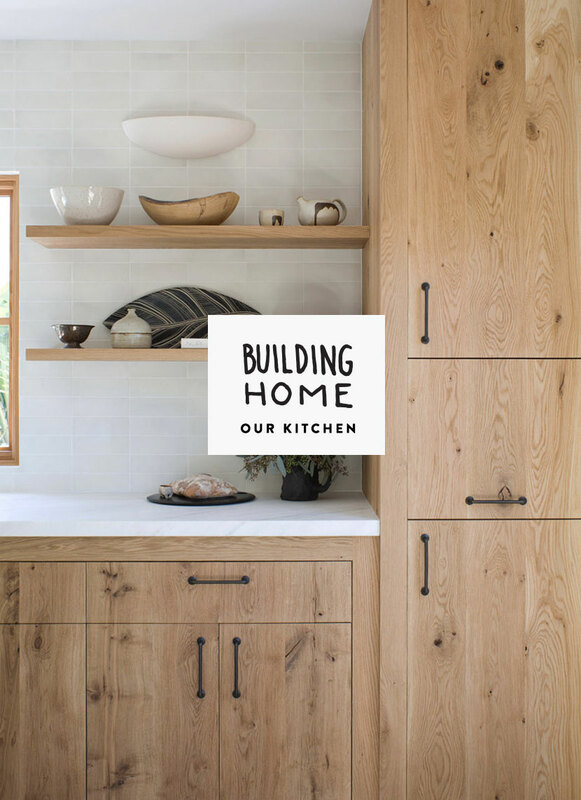 You can see more about our home building process in our Home section on the blog or on our Hashtag here. Love seeing all of the details you’ve put together for this room! 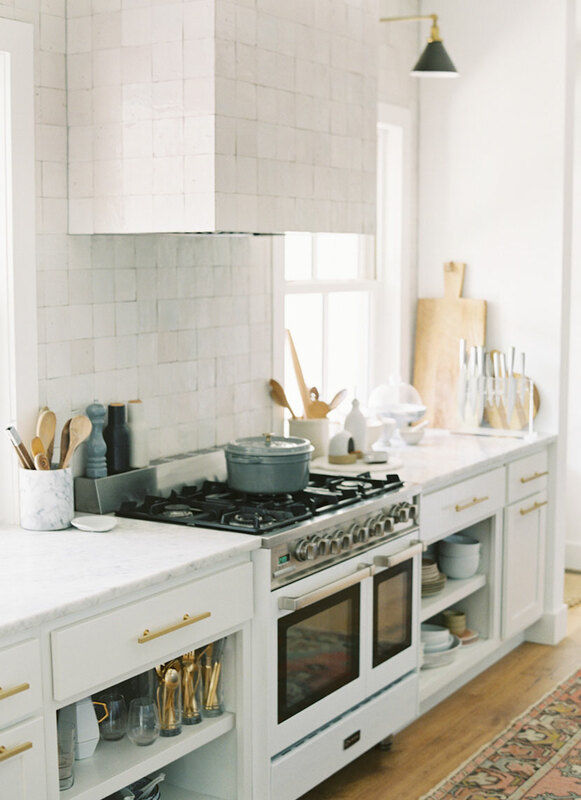 I can totally sympathize with wanting a big, open, beautiful space to cook and create memories — i think that’s the thing I struggle with most in my current apartment! So exciting! I can only imagine how much thought and effort went into every fixture decision and the overall design. 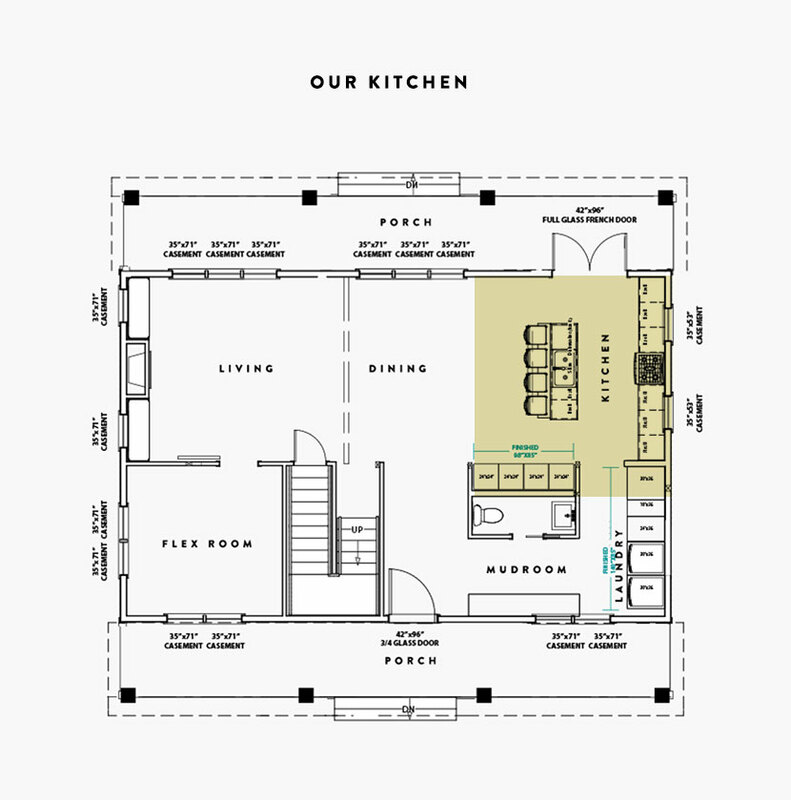 The concealed appliances and floor-to-ceiling food storage is going to be so nice. A fridge and pantry should always live side-by-side, so all the food is together, at least in my mind. 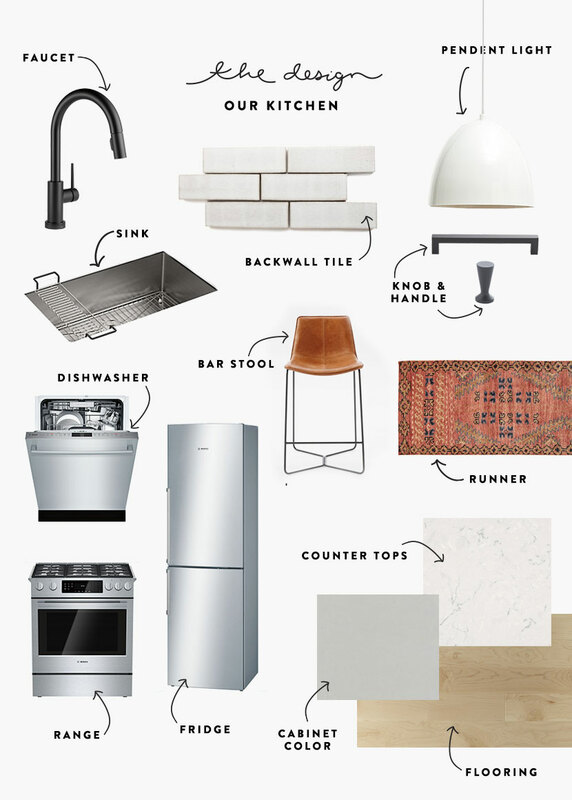 I also love how your cabinets will be flush with the range, and your counters will be so deep! I cannot wait to see the finished product, but this plan is already so exciting and easy to visualize! Its so beautiful and exciting!! I am a neutrals girl and my design would be very close to yours. you guys have some awesome ideas and I can not wait to see the finished product!! I’m so excited to see the finished product!! We have just retired from the military (26 years in, moving every 2-3 years etc.) 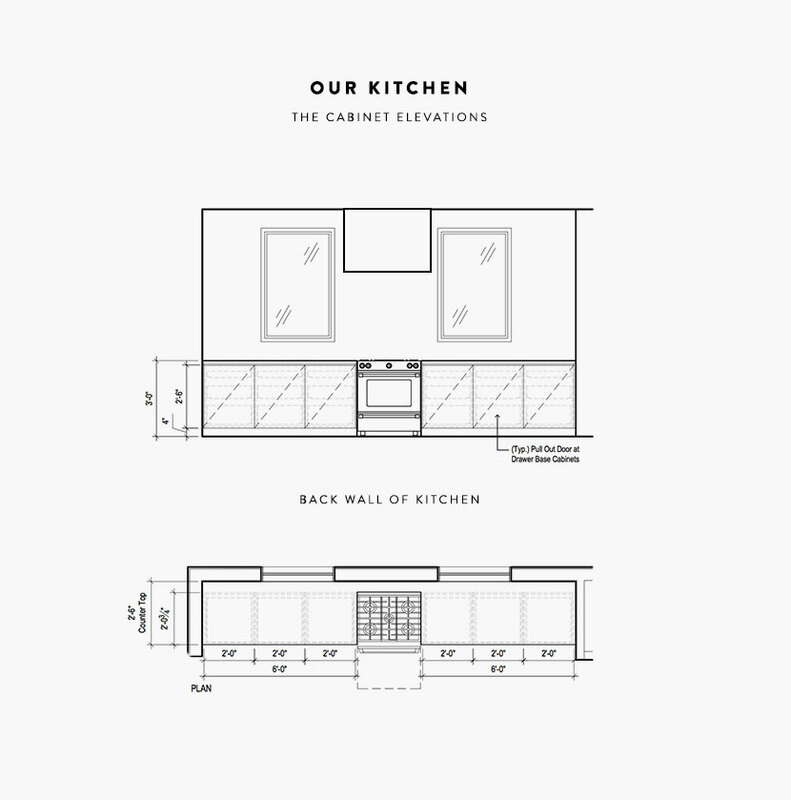 and got to design the kitchen in our “forever home.” We actually share a lot of ideas with you guys. We are 97% done (just waiting for the island counter to arrive, a light fixture, and crown molding around the vent hood…) We have owned, and successfully rented, the house for 15 years, and the kitchen has been the place we spent most of our reno budget. I know what I like, and how I work in a kitchen, but it has been a challenging process to say the least haha. We talked to different kitchen contractors before we decided to go with IKEA base cabinets that we custom built in to fit the space. We scaled back on all the trendy looks and went classic white in hopes we won’t have to update too much in the future. I could go on and on about kitchen functionality and looks haha, as it’s been on my mind 100% of the time for months and months!!! Good look, and like I said, I look forward to seeing your kitchen when it’s finished!